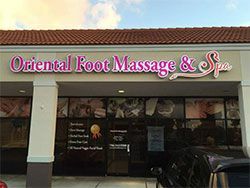 Oriental Foot Massage & Spa in Miami offers traditional professional Chinese foot spa, including foot bath, foot massage, herbal foot soak, detox foot bath, as well as natural fresh vegie & fruit facial mask while you're enjoying foot spa care. Since each part of the foot is reputedly linked to another, often distant, part of the body, with influence extending not just to the muscles but also to the vital organs as well, a full foot spa service will give you many benefits. At Oriental Foot Massage & Spa, you'll get your individually tailored service. Simply said, Oriental Foot Massage & Spa is your new way to overall health and wellness. We're open seven days a week with extended hours. You'll get the best healthiest you at an affordable cost. SPECIAL! First time: 1 hour foot massage free for members.